From Goodreads ~ Curious as to why no one has claimed their UK lotto winnings from you? Why no one wants to call about the box of cash valued at Seven million five hundred thousand DollarsUS (7,500,000.00 Dollars)? Why is no one responding to your PASSIONATE REQUEST FOR JOINT MUTUAL INVESTMENTS BENEFITS? "I see know reasons why you are been so skeptical about your bank draft presently in our custody." Scammers … we can tell you why. It’s your English. Your English is … bad. Inaccurate. Ungrammatical. Inappropriate. You’ll never swindle anyone out of their $59 wire transfer fee if your letter sounds like it was written by a drunken third grader. "English for Scammers" analyzes common mistakes, drawn from genuine correspondence and tells you how to improve your writing so that it is appropriate for standard business letters written in English. 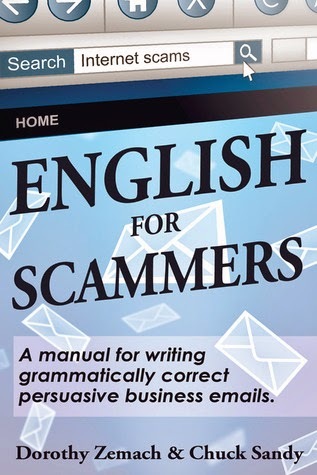 Use "English for Scammers" to hone your 419 letters – or even to write honest, clear, direct business correspondence. The choice, dear readers, is yours. According to the authors, the reason scammers don't get an overwhelming response to their proposals is because of their poorly written emails. All scammers should all buy this book because it's a step-by-step manual that explains their basic mistakes. In addition to explanations of the principles using actual emails we all have received, there are also exercises at the end of each chapter plus a final exam. For example, here is a question in one of the exercises ... can you spot the mistakes? I am Mrs Rabakha Phillip i have a Foundation home,i have a deposit $37.8m got your mail in web search i hope you are honest believer in Christ get back to me. Can you imagine the response the scammer could get if it had been written properly?! This book is written at a very low level that any scammer who is not fluent in English will understand. If you are fluent in English and write business emails, you may also pick up some basic tips. Note: I'm assuming the authors wrote this book tongue-in-cheek. I thought it was a quick amusing read. I know A LOT of people that could benefit from this book!